I find myself standing on the South Eastern tip of Iceland looking out across a bay beyond which the North Atlantic extends into the Norwegian Sea. The Sun is low, mesmerising colours fill the horizon and the water appears still as glass. Nature had conspired to offer me this incredible environment within which I contemplate the adventure I am about to embark upon, a timeless hour here spent immersed in my surroundings and processing the combination of excitement and fear that seize me. 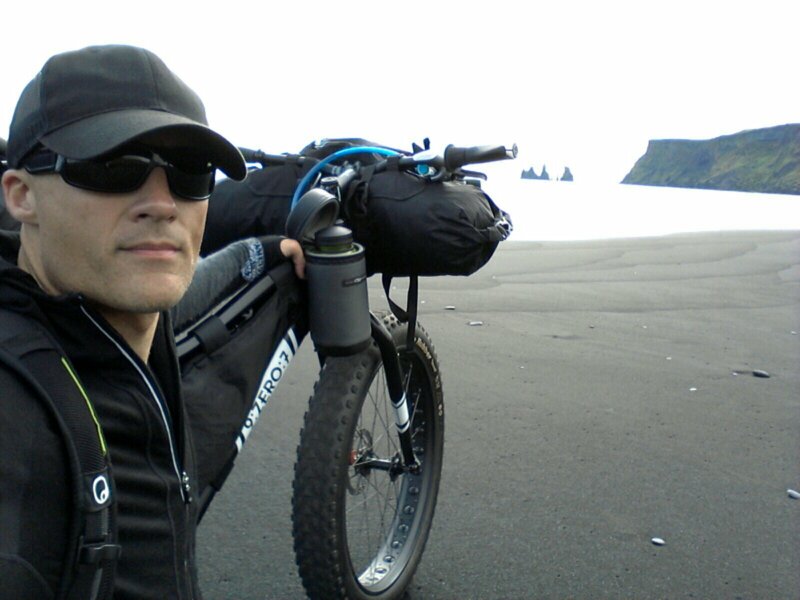 My name is Geoff Harper and this is the story of Unchained Iceland, a Fatbike Expedition of Icelands Southern Coast traversing the beaches from East to West on my 9:zero:7 Fatbike with Gates Carbon Drive and NuVinci® N360™ Continually Variable Transmission. This original expedition is an amalgamation of my passion for adventure, love of fatbiking and curiosity about the Land of Fire a Ice where I borrow heavily from experience gained mountaineering at high altitude. 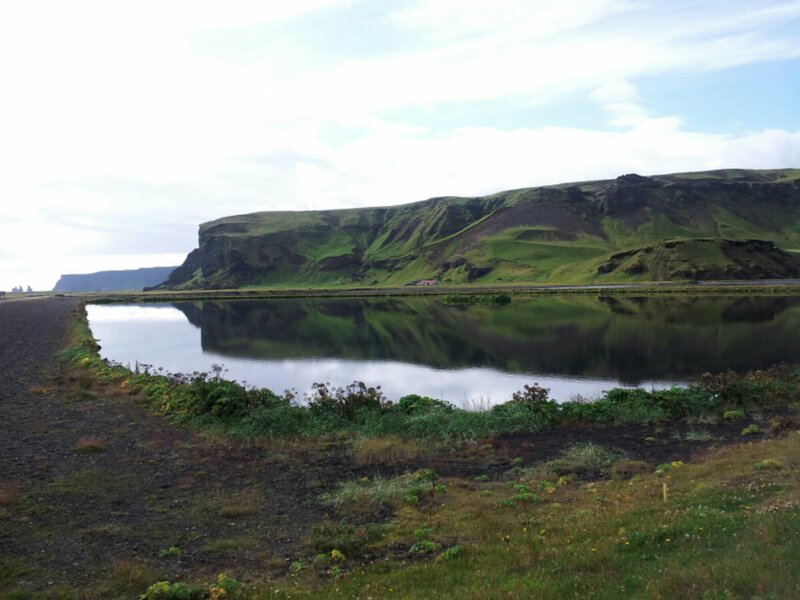 I had arrived in the fishing village of Höfn just after 6pm, the journey from Reykjavík by coach had taken 9 hours. Jetlag and the previous night spent ruminating and sleepless in my tent caused me to drift in and out of conciousness throughout the drive. 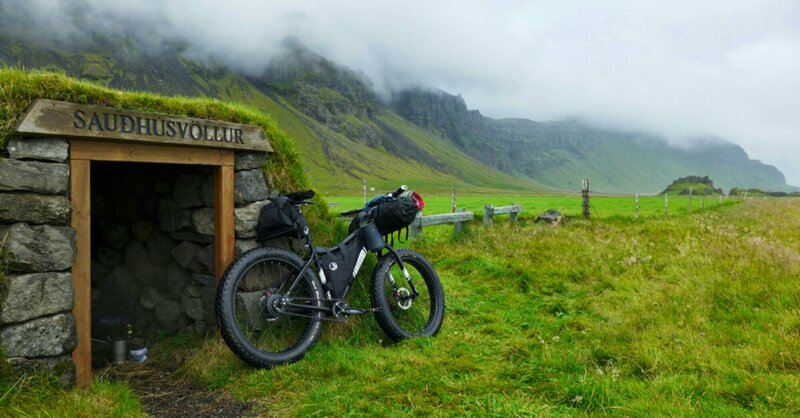 I awoke occasionally to see some of the most bizarre yet beautiful landscapes on the planet, lush green fields punctuated by outcroppings of moss-covered lava rock, jagged black cliffs with thundering waterfalls, glacial runoffs with fierce whitewater and glimpses of the empty beaches I intended to ride all the way back to Reykjavík. These sights were stunningly beautiful though somewhat overwhelming for my weary eyes. 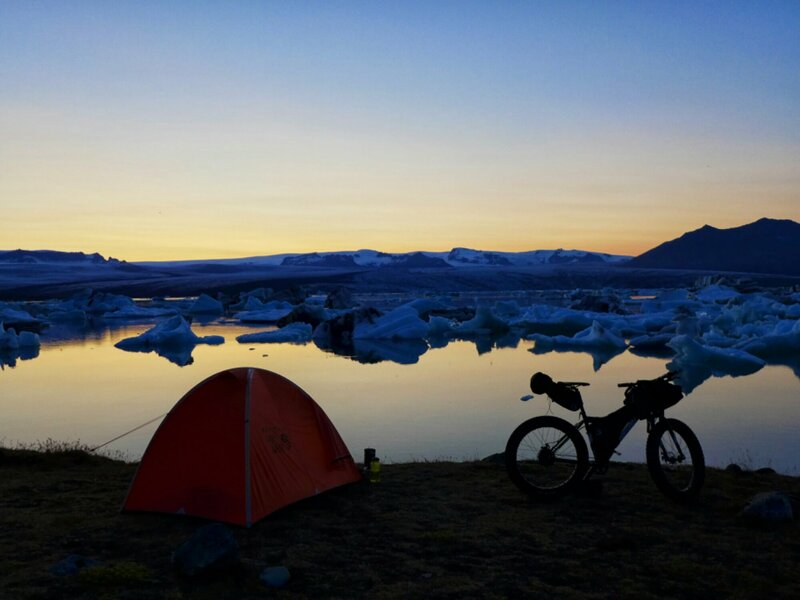 Up at first light it was 530am, relaxed and confident I ate a breakfast of buttered tea and hardfiskur (dried fish) then broke camp and packed and started pedaling. We’re off! Somewhere during those long winter training rides in the Colorado Rockies the fatbike and I had become a team, working together to perfect the setup. The road North out of Höfn was my only option because the bay has no beaches. 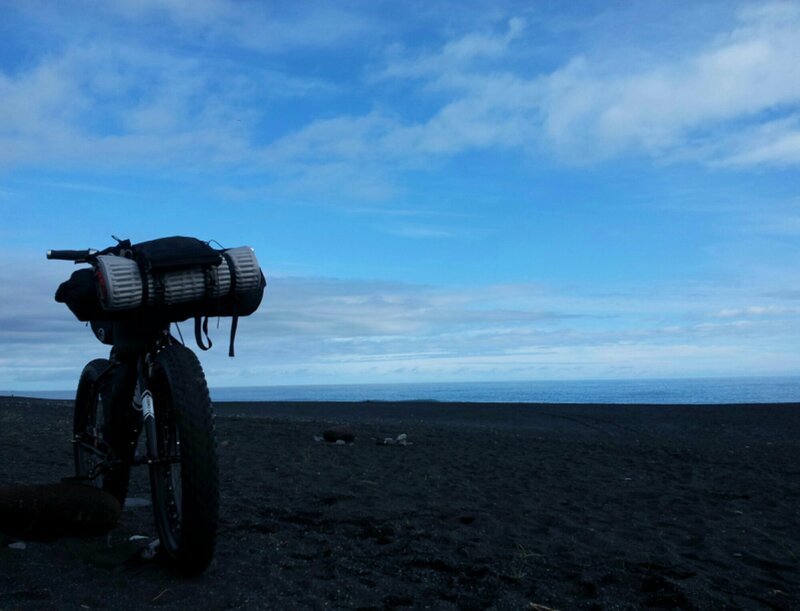 As the bay rounded to the West I laid eyes on rideable coastline for the first time, this was it, I was finally about to ride the black volcanic sands that I had dreamt of. A light breeze swept off the Ocean offering an encouraging tail wind with mid 50f temperatures, these conditions offered the perfect introduction. 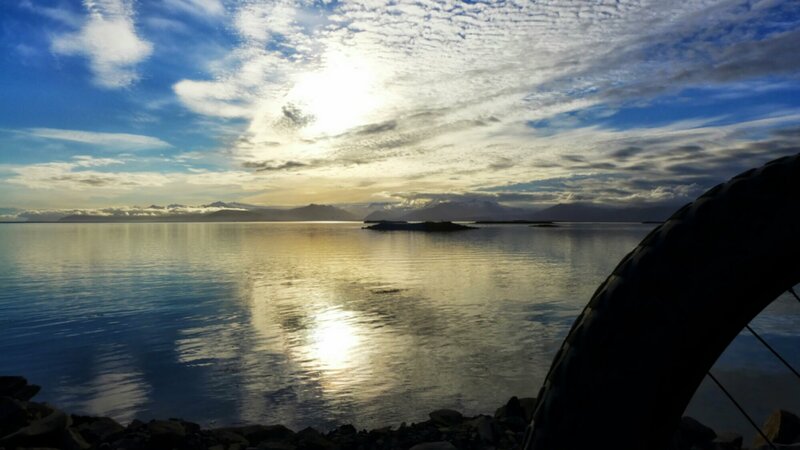 I rode blissfully covering about 50km total before setting up camp on a grassy patch protected by some large rocks. 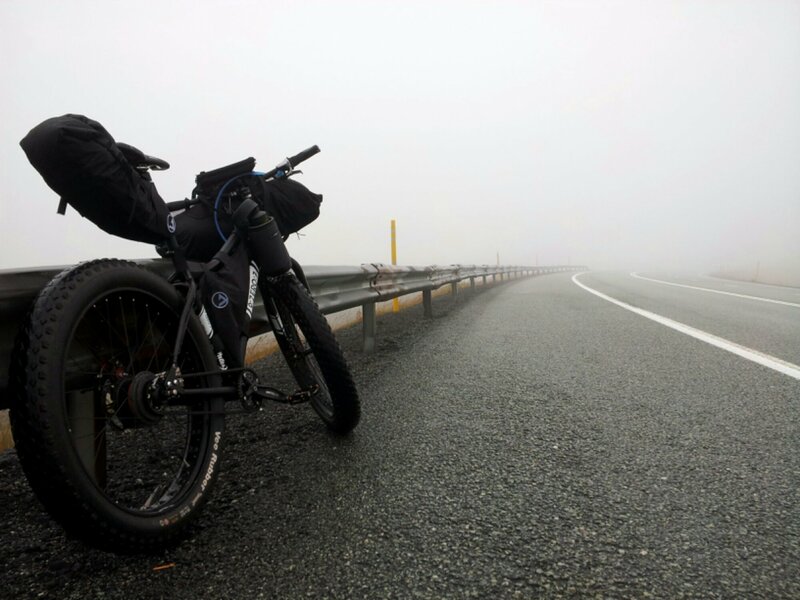 I awoke to the sound of light rain on my tent, I ate, broke camp, packed the bike and got moving quickly. 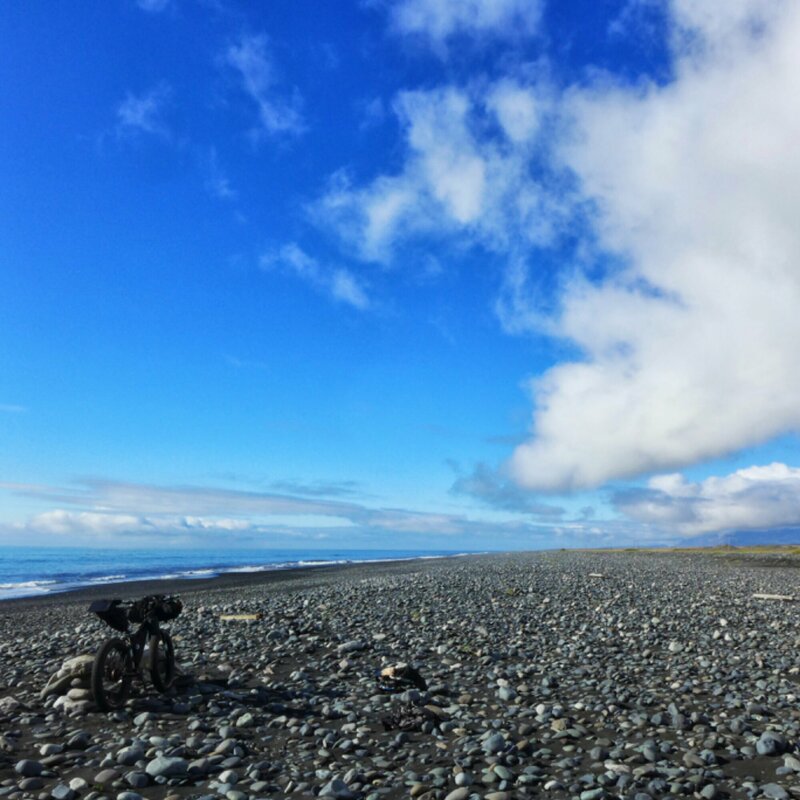 To my surprise the sun came out and a rainbow formed over the ocean, an encouraging start to the day as I rode the beach to Jökulsárlón. I had not planned to stay at Jökulsárlón however the sun shone brightly with temperatures in the low 60s, this glacial lagoon is a truly magical place and was simply impossible to breeze by. 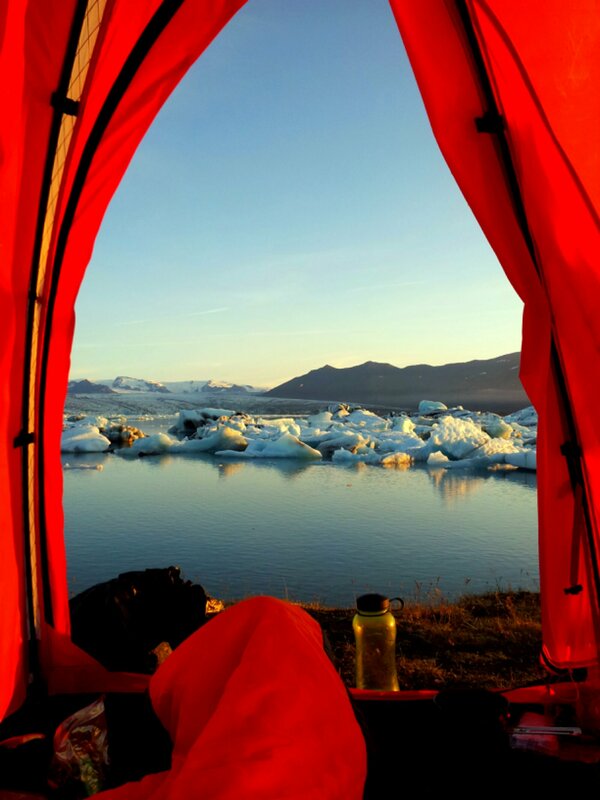 I found a spot on its banks and set up camp for the night, from my tent I watched as the house-sized icebergs jostled for position, cracked, crumbled and capsized, creating huge crashes of water. Temperatures plummeted at sundown getting close to freezing overnight. A chilly awakening, I took some early morning photos then rode along the banks of the lagoon which lead me out toward the ocean, I immediately encountered significantly stronger winds coming off the Atlantic in a North Easterly direction which required decidedly more effort to sustain speed within, this however was just a taste of what was to come. The beach narrowed as it neared the southern tip of Vatnajökull, Europes largest glacier, I felt a counter wind blowing from inland in a southerly direction, this wind came down off of Vatnajökull and it was cold. Soon enough both winds had increased in strength combining to make riding impossible and worse still, the vortex created as these opposing winds fought was launching sand into the air and reducing visibility to 10ft. 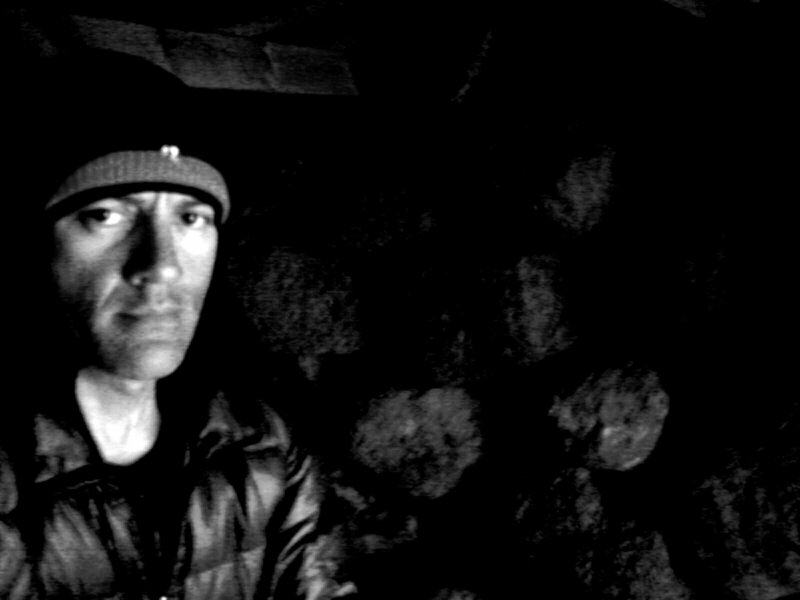 In retreat, I followed a glacial runoff inland and set up camp in a ditch to get out of the elements as best I could. It rained hard for most of the night with gusting winds testing the strength of my tent. I waited a couple of hours for a window of lighter rain before breaking camp. Today’s riding was preceeded by the daunting knowledge that I would be traversing the legendary Sandur often described as ‘soul destroying’. This 60km stretch would be the most treacherous, dangerous and frustrating obstacle would encounter in Iceland. The Sandur, much like a glacier has crevases with sand bridges and quicksand. I wove my way through the safest sand I could find, often as far as 20km from the ocean break. Though I could ride through some of the runoffs I was forced inland on many an occasion to cross bridges then returning to the Sandur, this proved to be exacerbating, a lot of effort for very little distance gain. I battled the Sandur for 3 days in total, an experience I will never forget. Andy Shackleton makes this valid point in his book Arctic Cycle that ‘getting caught in heavy rain is one thing however breaking camp in heavy rain is another’ to which I would add, breaking camp in heavy rain to ride the Sandur is yet another notch on the suffering scale. Riding away from the Sandur I came across a farm which had the camping sign by its dirt track entrance. An elderly farmer on a quad greeted me and motioned for me to follow him to a barn within which I set up camp. The quiet inside the barn instantly brought me down from the prolonged heightened state of the previous 3 days, I was absolutely spent both physically and mentally, the decision to stay in the barn for a couple of nights was easy, I would recover, regroup and let my gear dry out before leaving. Recovered, dry and confident in the knowledge that the toughest riding was behind me, seemingly I was rewarded with two days of unbroken beach and perfect weather, this was the Zen I had come for, absolute simplicity and childlike unabandoned joy, these two days serve as the highlight of the trip indelibly burnt into my psyche. The cliffs at Vik offered me protection, an idea with which thousands of Puffins agreed, they live and breed in these cliffs. I lay in my tent looking up and grining as they awkwardly flew above me, squawking and flapping their wings loudly as they circled the cliffs. A steep climb out of Vik on the road with a fast descent that took me back to the beach. Light rain and a mild headwind slowed me considerably. Heading inland I came across a shelter with ‘SAUDHÚSVÖLLUR’ carved into its header, wood framed with rock walls it was covered in turf and was once used to store milk. Small as it was (4ft x 4ft x 5ft) I spent the night there, hanging my groundsheet in the opening and placing my sleeping pad on the gravel floor I was without doubt feeling the effects of 2 weeks of wilderness. It took a couple more days to reach the town of Selfoss which had all the amenities of a modern city. A curbside brunch of Birch Smoked Salmon and Skyr yoghurt made a nice change from the sardines, instant soup and bread that I had almost exclusively existed on. 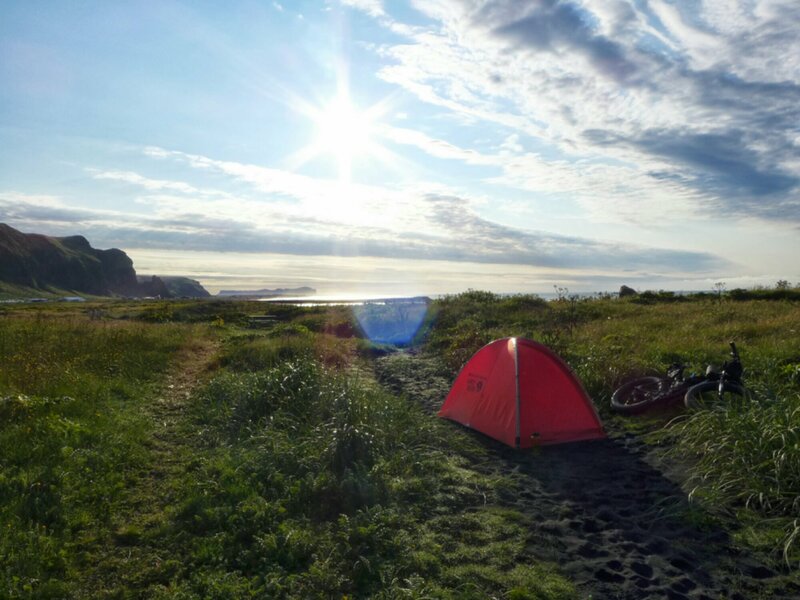 At the Selfoss campsite I met a host of other cyclists from all over the world; an Aussie couple, a Danish guy, some French guys, a German woman who was riding the ring road with her two young sons.Having spent more than a couple of weeks essentially alone these interactions were very welcome indeed, not just people but bike people whose stories and accomplishments dwarfed my own. 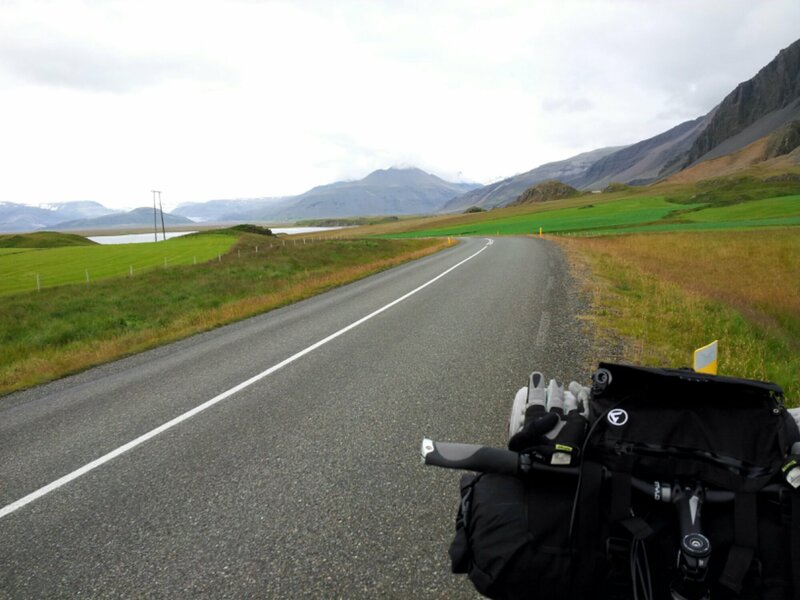 Though my original plan did not specifically include riding the roads of the SW corner of Iceland, now with enough time I was considering riding these roads and then on to Reykjavík. The Aussies were on the same plan, we confered and shared information. 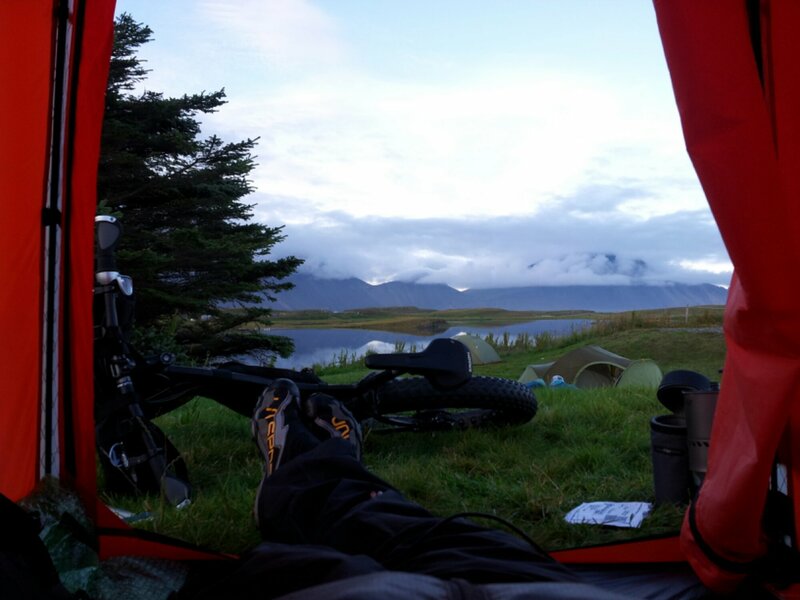 On day two at the campsite I decided that whatever the weather the following morning, I was heading out either SW to the coast or North to Hafnarfjörður a fishing village/harbour just south of Reykjavík. I awoke and checked the weather, a huge storm was emerging in the SE so I headed North in hope of avoiding it. An hour into the ride I was hit by the most torrential rain I have ever seen let alone attempted to ride in. 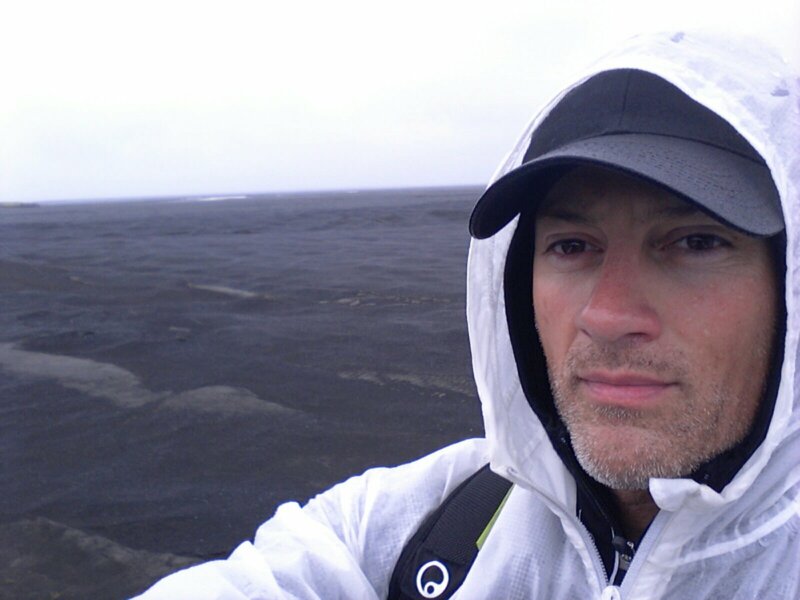 Tailwinds gusting up to 55mph blew me at full-speed and soaking wet toward Hafnarfjörður, a highly exhilarating and equally unnerving experience. 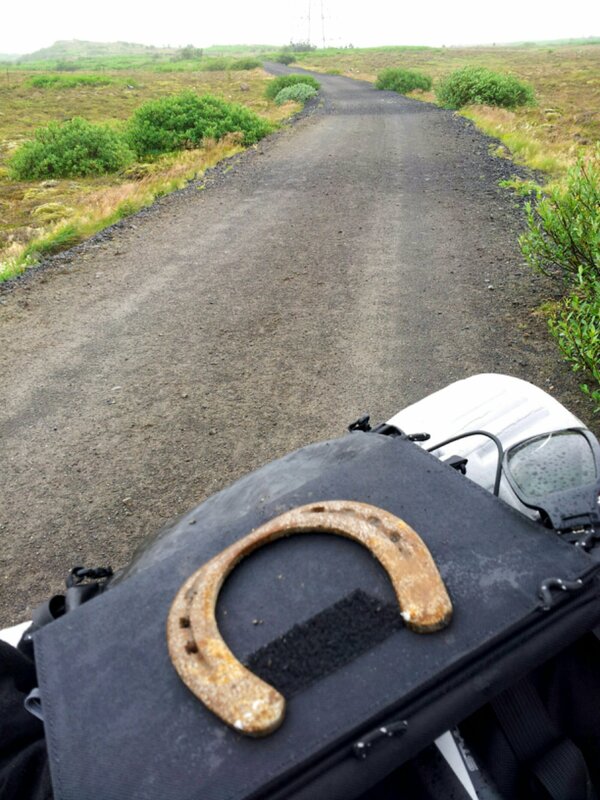 Eager to get off the road I cut through Heiðmörk Nature Reserve where I came across a horseshoe on the trail, a surreal moment ensued, holding the horseshoe in both hands I considered how lucky I was to be on this amazing adventure at the same time being thankful of the luck that had in turn kept me from harm throughout. Descending out of Heiðmörk I caught my first glimpse of Reykjavík with which came an immense sense of relief, I could see the finishline, I had made it. 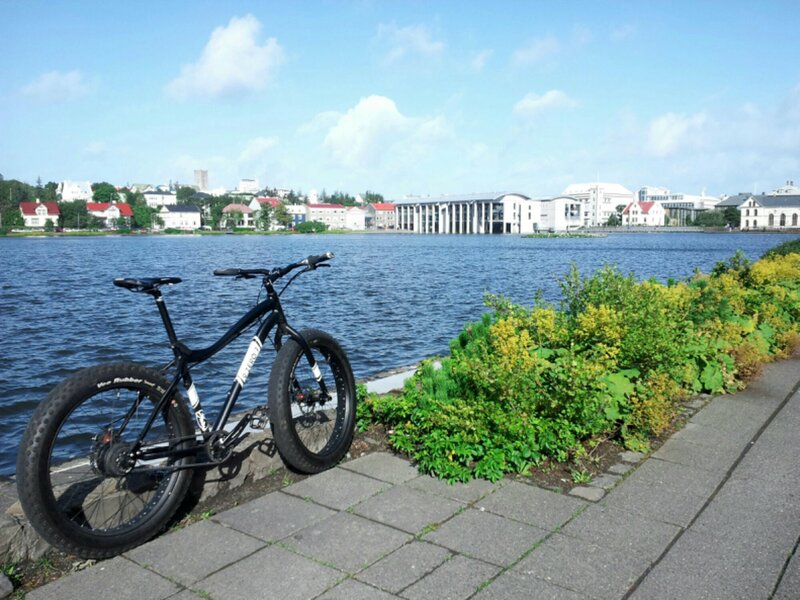 Mixed in however was the paradoxical realisation that the show was almost over, my physical reaction spoke for itself, stopping the bike and starring at Reykjavík in the distance, an emotional mix of fulfillment and denial, I was not ready to end this extraordinary journey. I arrived at Hafnarfjörður campsite weather beaten, hungry and a little disillusioned. An Adventure Scout group by chance from my home County of Surrey, England were staying at the campsite. Before I had checked in their Leader had assembled his Scouts around my dripping wet and disheveled self for an impromptu presentation. The Scouts were taken with my fatbike and my story, sharing my trip at this moment was the perfect catharsis and gave me instant perspective. Over the course of the 3 days I spent at the campsite a number of the scouts approached me individually with further questions which I was more than happy to answer. 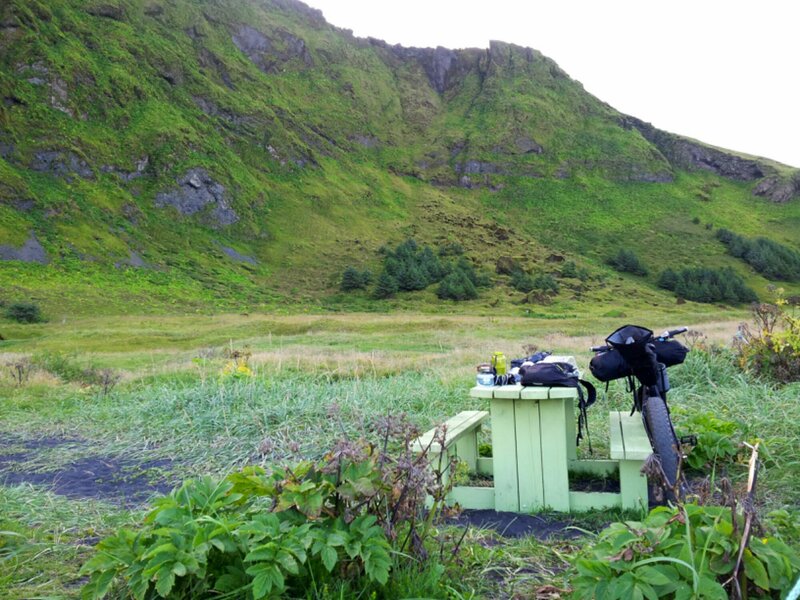 My window to ride the roads of the SE corner had closed with yet another storm battering the shoreline and with road riding being my only option I chose to head north to the same campsite in Reykjavìk where the adventure had begun. The expedition was tougher than I had fully realised though subconciously, I had suspected it would be. Moments of glassy-eyed elation followed moments of gut-wrenching hardship, again I knew these were in the post. What I overlooked however was the degree of self-knowledge brought about by the intensity of a solo trip such as this. Self-reliance was my only option with no choice but to trust my instinct where the will to keep moving, to stay warm, to find shelter and to eat were all I could think about for days on end and then conversely the absolute need to reconnect with people, those days spent alone in harsh conditions have forever changed my appreciation of a casual conversation and a smile shared with a stranger. This piece would not be complete without an expression of my sincere gratitude to all those that facilitated this truly incredible experience. Paul Tolmé, Todd Sellden, Mary Amari, Mark Chapman at Gates Carbon Drive. Katie Mckenzie, Jeremy Leffingwell, Cori McCormick at NuVinci. Colin Treanor and Bill Flemming at 9:zero:7. Ben Welnak at Mountain Bike Radio. Branden, Chad and Carissa at Black Shirt Brewing. Special thanks to Mum and Neen also to all the other truly authentic people in my life, you are my inspiration. How Blessed of a yogi are You?! wow… what great photos! thanks for sharing them. How the hell did you carry 3 weeks worth of food in that setup? That’s an absolute minimum of 62 meals without snacks. I carried up to 4 days food at a time and a 1 day reserve/emergency ration. I had designated food stops that I researched beforehand one of which had closed down! I ate a lot of dried fish (Hardfiskur), butter with 9kcals per gram is 1800kcal a block which would last 2-3 days and dried soups to which I added pasta. Weight to nutrient ration being paramount. Cool pictures! Excellent challenge! On other site I saw you used MSR reactor for cooking, was that easy to find the matching canister in Iceland? Yes Ana. any given campsite and gas station sold the canisters both the smaller and larger – I was surprised myself by this.